A water-emulsifiable solution to be used as a supplemental source of vitamins A and D in cattle, sheep and swine. Each mL contains 500000 IU Vitamin A and 75000 IU Vitamin D. Administer IM. For use as a supplement source of B complex vitamins in cattle, horses, swine, sheep, dogs and cats. IM injection is recommended; may be administered SQ or IV. Each mL of sterile aqueous solution contains: Thiamine HCl (B1), 12.5 mg, Niacinamide, 12.5 mg, Pyridoxine HCl, (B6) 5 mg, d-Panthenol, 5 mg, Riboflavin (B2), 2 mg, Cyanocobalamin (B12), 5 mcg, Citric Acid and Benzyl Alcohol, 1.5% w/v as a preservative. 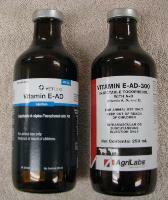 A clear, sterile, non-aqueous solution of vitamin A, vitamin D3, and vitamin E. Intended as a supplemental source of vitamin A, D, and E for dairy and beef cattle. Each mL contains vitamin A 100000 IU, vitamin D3 10000 IU, and vitamin E (as d-alpha-tocopherol) 300 IU. Administer IM or SQ only.